Is this not the recipe you wanted? Sorry for the confusion around here, it looks like my pin was shared with the wrong link. We are doing everything we can to fix this issue. In the meantime, you can find a search box on the top right side of the site and search for the recipe you are trying to locate. 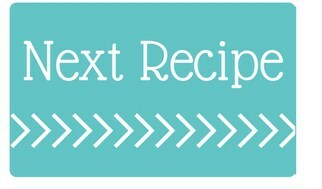 Please leave a comment with the recipe you ware looking for so I can do my best to edit the pins. Every family gathering since I can remember my mom made her famous cheese ball. We spread it on some crackers and everyone enjoyed it. 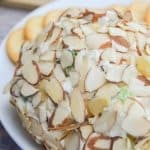 This holiday season I decided to put my own spin on my families favorite appetizer and made this bacon ranch cheese ball. I know when you add bacon to just about anything it can will make it that much better. My husband still tells me this is the best cheese ball he has ever had. This recipe will defiantly be my go to for any gathering! In a large bowl mix together cream cheese and dry ranch package. I used the good old fashion method, and mixed it with clean hands; but you can also use a mixer with a paddle attachment. You want to make sure you mix it well and have everything blended well. Now add your green onions and bacon and mix well and then shape into a ball. In a seperate plate lay out chopped almonds. 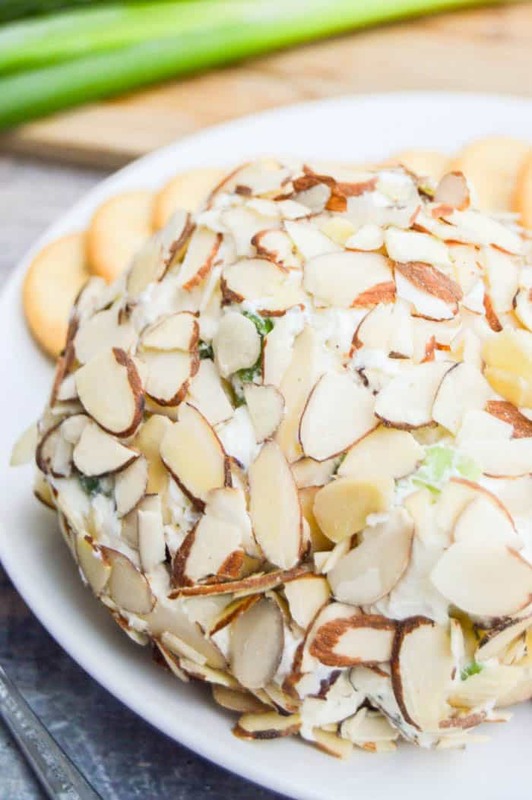 Roll cheeseball in almonds to coat then place it in the fridge and serve chilled. 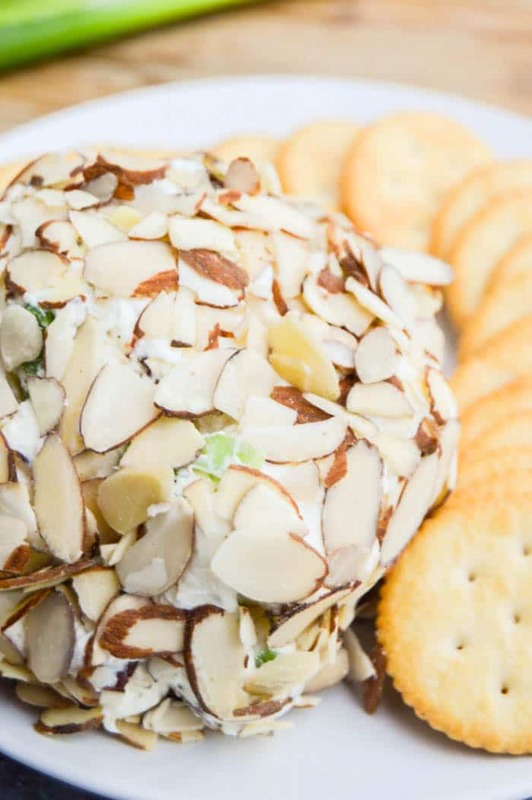 I love serving a cheese ball at parties. Super bowl, birthday, holiday, it serves well with all of it! Growing up my mom had her classic cheese ball recipe that she would make for every family get together. It was always served as an appetizer to munch on while holiday dinners got finished up. Maybe thats why I think they should be served at every get together. This recipe is really different then the one my mom made. I added two of my favorite things ranch and bacon! I let my cream cheese sit out for just a few minutes to get a little softer and make it easy to mix. I added it to a mixing bowl with cooked and crumbled bacon, ranch seasoning, and green onions. Mix it up until everything is well combined then form a ball. Roll it in sliced almonds and then place it in the fridge to chili for a few minutes. I served mine with crackers but it would also work with bread or even raw veggies. More Appetizers for you to try! Slow Cooker Sweet and Sour Meatballs: These Slow Cooker Sweet and Sour Meatballs are perfect served with rice for dinner or as a tasty appetizer. Meatball Italian Sliders: The BEST meatball placed between bread. I topped it with Mariana sauce, cheese, and then baked. 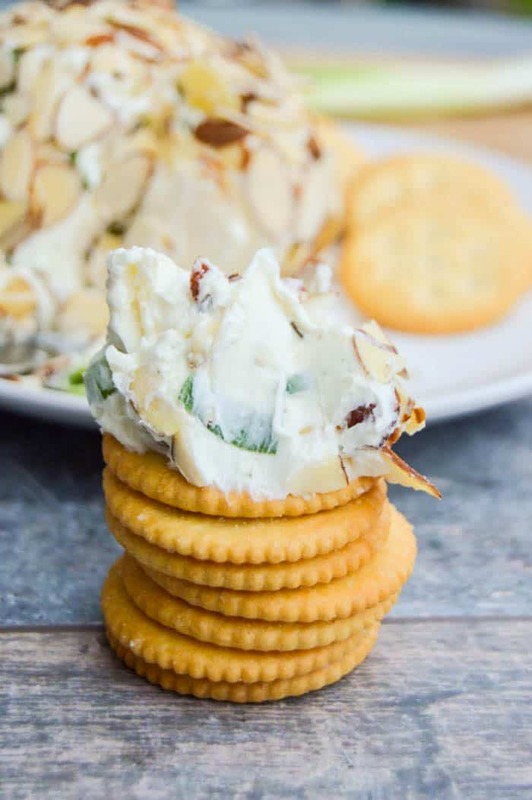 In a large bowl mix together cream cheese and dry ranch package. I used the good old fashion method, and mixed it with clean hands; but you can also use a mixer with a paddle attachment. Add you green onions and bacon and mix well and then shape into a ball. In a seperate plate lay out chopped almonds. 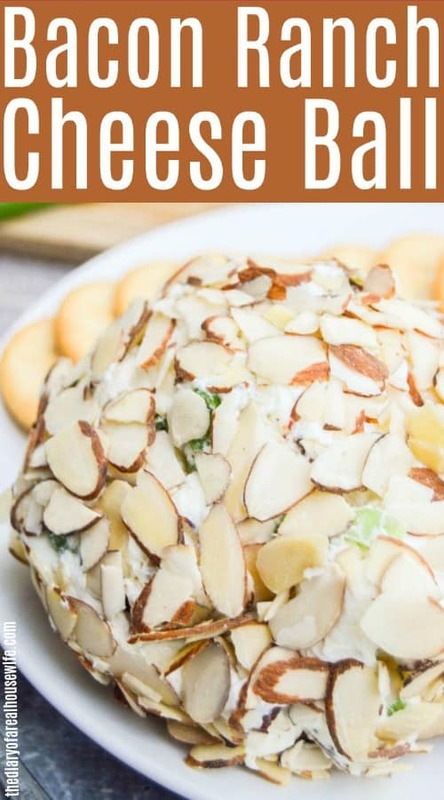 Roll cheeseball in almonds to coat. I really need to make a cheeseball one of these days! This looks so good! I clicked on a link to the turkey chili crockpot and got this instead. Please fix! 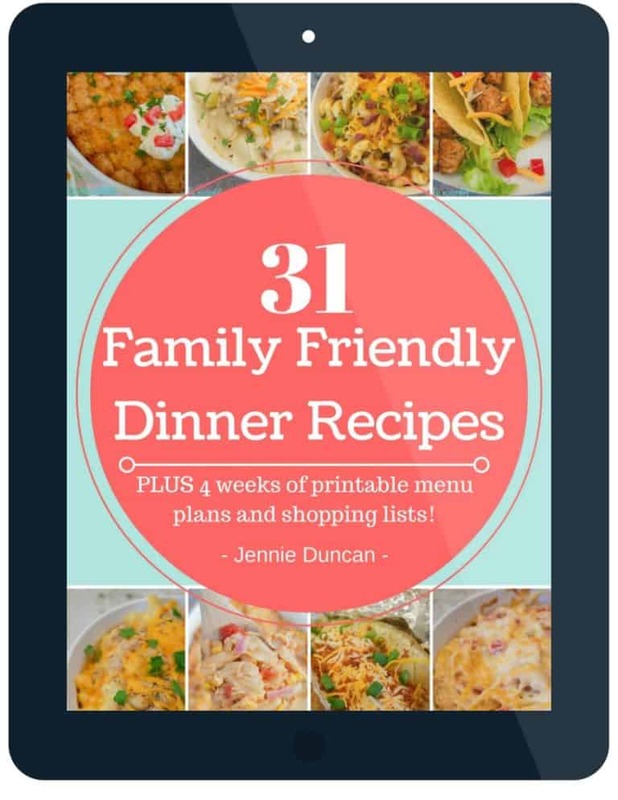 Trying to get to the slow cooker beef stew and pinterest keeps sending me to this page. Trying to get to the Taco Mac recipe, but Pinterest brought me to the Bacon Ranch Cheeseball. Can you provide the correct link please? Hi I’m trying to get the recipe for the Easy Orange Chicken, but the link keeps bringing me to the Bacon Ranch Cheese Balls. Can I get the link for the Orange Chicken, please? Sorry for the confusion. It looks like someone is pinning my images and putting the wrong link. Hi Barbara, so sorry about that! It looks like someone is pinning my images and putting the wrong link. I will do my. best to get those updated. I have a few tater tot recipes so not sure which one you wanted if you let me know I can send the link otherwise you can use the search feature on my site and do a search for tater tot and is should come up. Looking for the egg salad! Sorry someone jacked you links. Sorry about that Tanya! Thanks for understanding! Sorry for the confusion. It looks like someone is taking my images and putting the wrong URL for them. I do have a Dr. Pepper BBQ Chicken recipe for the slow cooker but not instant pot. Hi I’m trying to get the recipe for Mini Cornbread muffins and it brought me to this cheeseball link. Could you provide the link to the cornbread muffins? Hi Jessica! 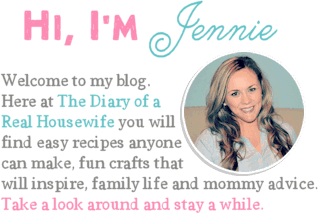 So sorry about that, not sure but for some reason someone is pinning and changing my links. It sends your cheese along link when I am trying to reach your Taco soup recipe!! What’s up??? Hi Julayne, sorry for the confusion! It looks like someone is pinning my images with the wrong link. I was looking for the beard oil instructions and got this cheese ball recipe…can you correctly link me to the Beard Oil? Hi Mark, sorry for the confusion! It looks like someone has high jacked my pins and changing the URL. Thanks, Keisha for letting me know. Someone has been pinning my images with the wrong link and since I was not the pinner I can’t edit it. I’m sorry that happened and trying my best to locate the pins. And for some reason, they are all linking to this recipe. I do have a search bar so you can find more recipes if it happens again, thanks for letting me know! !